What unites us as a people? What divides us? Are there certain core traditions, customs, or beliefs that help define us? Especially in the United States, a melting pot of different nationalities each with their own customs and traditions, how do we discover and appreciate our cultural identity? These are just a few of the questions addressed in the Cultural Studies collection, with titles that illuminate the history, religion, customs, symbols, and lore related to our culture. 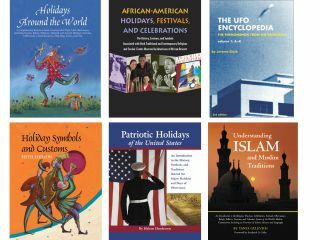 These multi-cultural titles are key resources for teachers, students, and others interested in understanding different cultures, countries, and ethnic groups. For specific details on the Cultural Studies collection, see the individual titles, with descriptions and sample pages. Holiday Symbols and Customs, 5th Ed. Describes the origins of more than 350 holidays observed in the United States and around the world. Explains where, when, and how each event is celebrated, with detailed information on the symbols and customs associated with the holiday. Includes contact information and web sites for related organizations. Holidays Around the World, 6th Ed. A comprehensive reference guide that covers over 3,500 observances. Features both secular and religious events from many different cultures, countries, and ethnic groups. Includes contact information for events; multiple appendices with background information on world holidays; extensive bibliography; multiple indexes. Provides information about the history and celebration of American patriotic holidays and days of observance. Features include narrative overviews, primary source documents, chronology, and print and web sources for further study.